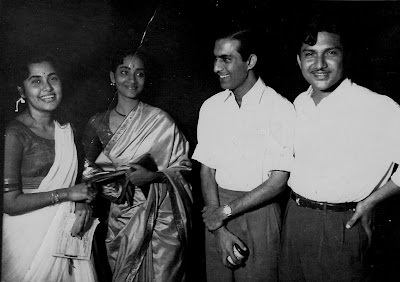 When I first began this series a year and a half ago (with Hrishikesh Mukherjee) I wrote: "...this series is an attempt to throw some light on the men and women behind the screen." I began with a director and a music director, and went on to two lyricists. These are people who are still known to some extent because when you hear a song over the radio, they do announce the music director's and lyricist's name. When you see a film, you do know who the director is. It is very rarely that you know about the individual musicians who form the orchestra for film-music; the subject of this post, however, is a man who was very well-known by his generation for his virtuosity with the Hawaiian guitar, the electric guitar, and the violin. But Internet searches had thrown up very little information about the man, or his music. It was like someone had lit a stick of dynamite under my father. "Van Shipley? ", he almost stuttered. "You mean, the man who played the guitar for Raj Kapoor? He is your friend's father? Do you think you could take me to meet him?" I had never seen my father so excited. He was like a child in a toyshop. So, my brother-in-law reluctantly herded us all to Audrey's house; Mr Van Shipley was recovering from a stroke at the time, but he and auntie were warm and welcoming to someone who was such a fan and had come exclusively to meet him. My father, having met someone he had long admired, was beyond happy. He lectured me all the way home on just why Van Shipley was such a great musician. About six months ago, Dustedoff wrote a tribute to her uncle, and I remarked that it was such an important task that she had undertaken - to add to our knowledge of who her uncle was, and the music that he was associated with. In reply, she encouraged me to write about Van Shipley. It was just the impetus I needed to write to Van Shipley's eldest daughter, Ingrid Van Shipley, introduce myself, and ask her if she would help me with the task I had set myself. So, today, on Mr Van Shipley's 5th death anniversary, my humble tribute to a great musician and a wonderful human being. Van Shipley was born Valentine Van Shipley in Lucknow, Uttar Pradesh. Born to parents who were music lovers themselves (his mother was a wonderful sitarist, and a student of Ustad Yusuf Ali Khan), young Van Shipley learnt to play the tabla, the violin and the guitar. His first violin lessons were from Gagan Chatterjee, an Allahabad-based violinist. Ustad Vilayat Khan was his schoolmate and friend, and even at that age, Van Shipley gave sangat on the violin to both Ustad Bande Hasan Khan and his son Ustad Zinde Hasan Khan, from whom he would further his knowledge of the violin. He became friends with sitar maestro Ravi Shankar in Lucknow in 1941, a friendship that was to last until his death. 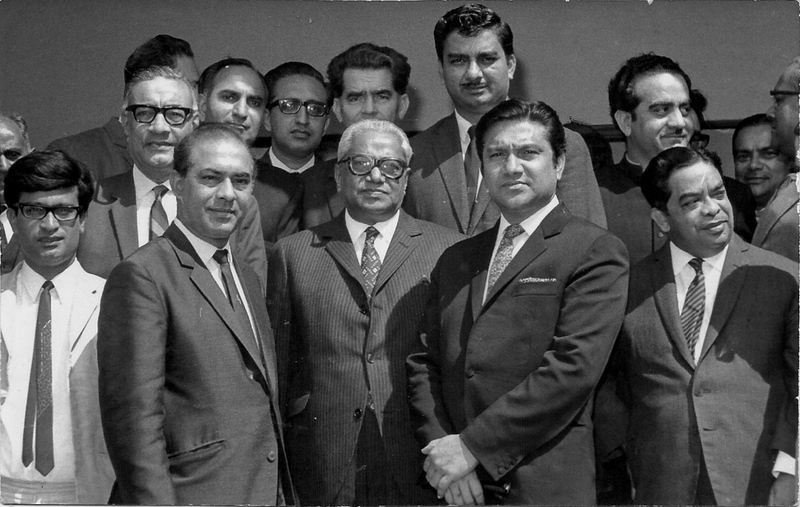 It was while studying at Aligarh University that Talat Mahmood, a classmate, invited him to join All India Radio, Lucknow. While there, he took lessons from Ustad Allaudin Khan on the violin and also from Ustad Ali Akbar Khan. 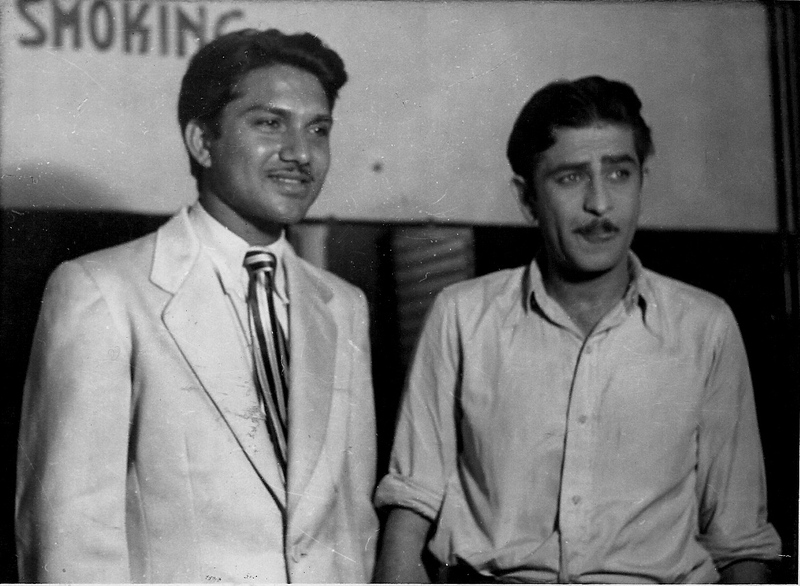 Van Shipley's film career took off with Chand, where he assisted music directors Husnlal-Bhagatram. 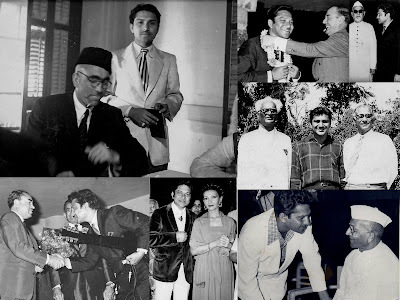 While in Pune, he shared quarters with Dev Anand and Guru Dutt, and formed a close friendship with Rehman and Sapru. When Prabhat films split into two, he joined producer Baburao Pai in Bombay. 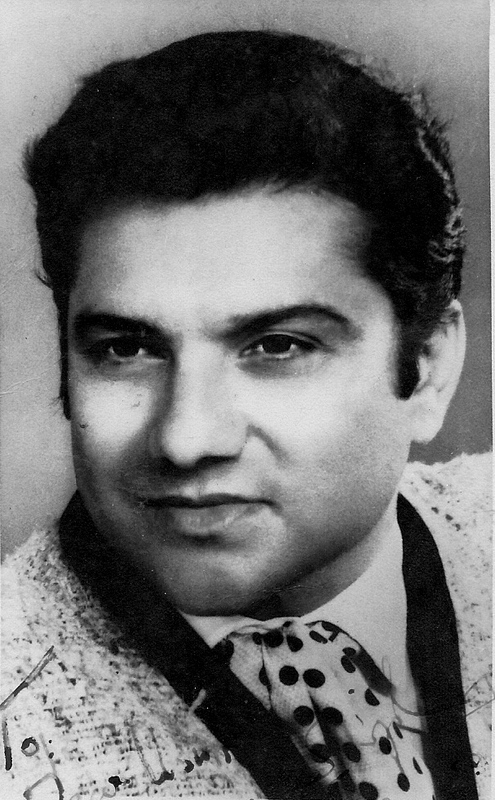 His earliest films were Nargis (1946), Anmol Ghadi (1946) and Mera Suhag (1947). He was soon working with music directors like Khemchand Prakash, C Ramchandra, Anil Biswas and Ghulam Haider. Soon, Van Shipley began making waves as a soloist, and was in great demand. The melodious strains of his guitar can be heard in SD Burman's composition for Geeta Dutt in Do Bhai. Here, he switches instruments and his violin can be heard in this famous song from Pehli Nazar (1948). Recorded under Anil Biswas' baton, this was one of Mukesh' earliest successes. Performing at a show held at St Xavier's College, Bombay, he impressed Raj Kapoor, who had just released his film Aag the year before. 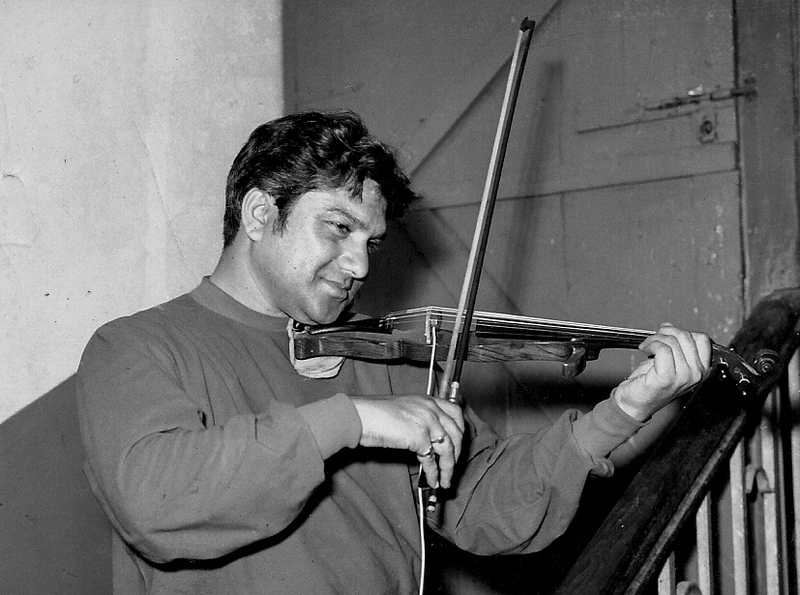 Raj Kapoor was ready to film his second film Barsaat (1949), where his character played the violin. Van Shipley did the violin playback for the entire film. The hugely successful film skyrocketed not only the careers of Lata Mangeshkar and Shankar Jaikishen, but also ensured that Van Shipley became a name to be reckoned with. He became an integral part of Raj Kapoor's team of musicians. In 1952's Awara, he added his electric guitar to the famous dream sequence. This one song is enough to forever enshrine his name in the pantheon of the greats. Van Shipley had designed his own electric guitar in the 1940s. It was an unique eight-string guitar that was designed to give him the drone sound that was common to Indian classical music. He is considered the first electric guitarist in India, and was the first to record instrumental versions of film songs, beginning some time in the early 50s when the success of Barsaat brought him to the notice of recording company, HMV. Here is one of his instrumental pieces, the immortal Zindagi kaisi hai paheli haaye. 1953 saw him play the guitar in Raj Kapoor's Aah. Listen to Ye shaam ki tanhaaiyaan - Van Shipley's begins a guitar interlude at mark 1.04. Jab Pyar Kisise Hota Hai (1962), the only film that Shankar-Jaikishen did for Nasir Hussain, would see Van Shipley play the guitar from the time the credits roll - the instrumental version of Jiya ho, jiya ho jiya kuch bol do. He was a prolific musician and worked in more than 1500 films, and was one of the few individual musicians who was mentioned in film credits. It was in 1955 that he teamed up with Enoch Daniels, the accordion player whom he met while at Prabhat Studios, Pune. It was a partnership that would last many, many years. In 1956, along with Talat Mahmood and CH Atma, Van Shipley and Enoch Daniels would tour British East Africa - they pioneered live stage shows by Indian performers. Van Shipley had first gone on a six-month tour of South America, the Hawaiian Islands, and South Africa in 1947, to study the music of those countries. He would continue to tour the world on live shows, prompting his other nickname, 'The Restless Globetrotter'. He performed for heads of state, including names like Jawaharlal Nehru, Zhou En-Lai, Gamal Abdel Nasser, Alexei Kosygin, the Aga Khan, Mrs Indira Gandhi and VV Giri amongst others. Van Shipley spoke impeccable Urdu, and had his own calligraphy set so he could write the language. He was also a fine painter, and a keen photographer. According to Ingrid, every time her father was home, he would pull out his camera, and make them pose. Friends and family are in possession of his paintings, which he gave away almost as soon as he painted them. A little known fact about Van Shipley is that he also acted in a few films, beginning with guest appearances in Fareb (1953), Dharampatni and Carnival Queen (1955). He aos composed the background music of for Fareb (1953) You can see him in the background of this dance number from Cha Cha Cha (1964). Van Shipley also acted as the hero in a couple of movies, which, according to his own notes, did not prove to be successful. But his musical legacy lives on, and even today, music aficionados from all over the world, trawl the 'Net for his music. This post is just the tip of the iceberg. Van Shipley's scrapbook, which Ingrid trusted me with, is a treasure trove of newspaper clippings and photographs, with uncle's notes scribbled all around the edges. (Thank you, Ingrid!) I hope to be able to do something more with them than just this post, but it will take time. In the meantime, this post is a personal, and heartfelt tribute to the gracious and gentle man who made absolute strangers welcome in his home. Thanks Anu for reviving a long lost memory. When I looked at the title of the post I wondered if it was some old English film, but then the bell rang even before I read the text. These days one can't escape the piano of Brian Silas. During our college days it was Van Shipley all the way. We loved his music. It is good to relive these memories and to get these lovely nuggets of information about the man and his art. Instrumentalists are possibly the least noticed of the people who go into the making of the song. The singer takes the cake followed by the composer. Even the lyricist often cedes the third place to the actor on the screen. Instrumentalists are seldom mentioned. AK (Songs of Yore) and I have often discussed the possibility of a post on songs in which an instrument plays as important a role as the voice. Some examples would be accordion in 'Awara hoon' and 'Ae mere dil kahin aur chal'; mandolin in 'Leheron pe leher' and 'Bechain nazar betaab jigar'; flute in 'Main piya teri tu maane ya na maane'; Sarod in the sad version of 'Suno chhoti si gudiya ki lambi kahani' and Shehnai in almost all songs of 'Goonj uthi shehnai'. One could also mention the tabla in 'Naache man mora magan tig da dhi gi dhi gi'. We all know who played the flute, sarod and shehnai in the songs above. But the other artists need to be recognized too. Thank you, Subodh. It is sad, isn't it, that these people are almost invisible, except to some listeners who are interested in the music behind the song. There is so little that is known about them. One seminal work on the background musicians was Gregory Booth's Behind the Curtain: Making Music in Mumbai's Film Studios. It had some fantastic interviews with Datta Ram and others. Very well-researched. I have an addition to the post you and AK discussed. Manohari Singh's saxophone in Haay duniya usi ki. The accordion in Awara hoon was, I think, Enoch Daniel. Then there was Van Shipley's violin in Barsaat. Oh, do, do the post, Subodh. It will shine some much-needed spotlight on these men who are such an important part of the songs we've heard and loved. A good piece and a great effort on a very great musician.There is hardly any information on him( and others like him) on the net. I look forward to read your posts to be written based on the great man's notes. Congratulations. Thank you, Shyam. Yes, the more we can find out and record about musicians like Van Shipley, the better records we will leave for future generations. It is a pity that we have already lost so much. Thanks for one of a very fitting tribute and an introduction to the veritable treasure. A tribute, not only to Van Shipley, but, in turn to all those great (less-known) foundation stones of the great heights that Hindi Film Music reached. And the veritable treasure in that, coming in from his own scrapbook, the legacy on 'Net' on all such great instrumentalists and music arrangers has become richer. As noted by Subodh Agrawal, Van Shipley, along with Enoch Daniels used to be a big draw in annual college fetes of our days (late 60s) as well. http://www.in.com/van-shipley/music-1913537.html has great audio files of the songs played by him. Here are two links to his great photographic memories from the covers of his EP albums - http://3.bp.blogspot.com/-IArHkxZSrkw/TrkOmFir5rI/AAAAAAAABJU/FoxcaqnQHIk/s1600/Van+Shipley+front.jpg and http://2.bp.blogspot.com/-Vb7Fh7yWopI/TrkOcwdWa3I/AAAAAAAABJM/etE27pP3_6s/s1600/Van+Shipley+back.jpg – as my humble contribution to re-live his cherished memories. This is such a treasure, Anu! Thank you so much. This made for great reading, not just because I got to know more about Van Shipley (for example, the fact that he even acted - I didn't know that), but also (as you'll have guessed) because my father and his family knew the Shipleys. The two families were neighbours in Saharanpur, and Van used to be called 'Gina' by our family. 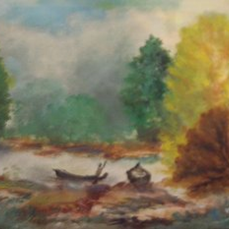 In fact, one of his paintings used to hang on a wall in the ancestral home in Saharanpur. Thank you Anu. As i said before, you did a wonderful job at short notice. And yes, as dustedoff wrote Dad was called Gina by his family and friends in Lucknow, Sahranpur and Delhi. I've asked Audrey to look for more of Dad's stuff while she's in Bombay so there should be more material for you in the near future. Dustedoff, I remember you telling me that uncle's painting still hangs on the walls of your ancestral home. According to Ingrid, whenever her father was at a loose end, he picked up art supplies and began to draw - he also gave away his paintings (and his records) to whoever asked. And yes, your uncle and Van Shipley did play together - one of Van Shipley's songs was Aayega aanewala. :) The reason I didn't add it in this post was because I do not know what instrument he played for the song - he played multiple instruments very, very well. It wasn't the guitar, because Sadu said there was only one Hawaiian guitar in the song (and no electric guitar at all), and you had confirmed the guitar pieces were by your Vernie tau. I didn't want to add anything without having absolute confirmation about its veracity. Your uncle must have played with him on Barsaat as well. When you get the compilation, could you please let me have the ones that Van Shipley appears in? It would be very useful for a project that I'm working on. Thank you, Ashokji. :) I'm glad so many people remember Van Shipley and his music. And thank you so much for those links and album covers. It will be of much use to me. Thank you Anu for driving me back so many years.I remember the Shipleys of Saharanpur from ,perhaps 1948 onwards . They were family friends .His elder brother Bob(who played the violin also) and younger brother Ginger(who strummed the Spanish guitar)and youngest sister Bebo(I don't remember her name ,naturally! ),a powerful soprano were all talented musicians.His nephew Malcom is also a professional Guitarist. Incidently ,Van Bhai(his pet name was Gina) played the violin piece (Anniversary song)which became associated with RK Films LOGO, in "Barsaat" . Certainly I will, Anu. If I can figure out which ones Van Shipley featured in! If I send you a list of the songs on the CD (whenever I get it), I suppose Ingrid or one of her siblings might be able to say which of them had Van Shipley among the musicians. It's funny, no, come to think of it? Both your uncle and Van Shipley played the Hawaiian guitar, though the latter had modified his. I'm assuming that if your uncle was playing the guitar in those songs in which the two collaborated, Mr Van Shipley must have been playing the violin? I wonder. I should check with Ingrid. :) Thanks for the offer. It will be nice to have the songs on hand. Thank you so much, Shilpi. I'm so glad to hear that I'm not the only person who was impressed with his graciousness and gentleness. He had such a warm smile too. Thank you Anu. Such personal posts about film personalities in the past are very heart warming. My mother used to talk about Van Shipley. That's the first I ever heard of him. Unfortunately I never had any converstaion with her to learn more about his music from her, as she seemed to be quite a fan. I was very impressed with his designing his own guitar and the electric violin. That has to be really clever. Wonder if others used it too, even today. Forgot to mention the songs. The one by Geeta Dutt from Do Bhai I've known for a long time. yeh shaam ki tanhaiyian has been one of my favourite songs forever. The piece of guitar music is so distinct there. I think I'd heard it before but never thought of it as a Mukesh song. Thank you, pacifist. I always wondered whether I should do a post on him, and DustedOff's encouragement and Ingrid's support made it finally possible. Oh, how I wish you could have shared some thoughts about his music! It would have made everything so much more personal! I think these are the reminders to us to record experiences, and memories. The past dies so quickly otherwise, no? Thanks, pacifist. :) I'll be back with more of his music as soon as I can find a way of putting audio files into Blogger! This is a wonderful post. As Subodh and Mr Ashok Vaishnav have mentioned, our generation was familiar with the names of Van Shipley and Enoch Daniels in our college days, which says a lot about their talent - for someone in the background to shine like this. In my case, while I knew about their music I was not very clearly aware of their exact film connection. My reason for familiarity was a slot in AIR which broadcast instrumental renderings of famous songs. Later their independent LP's and cassettes became immensely popular. Now when I think about it, they made immense contribution in giving body and shape to the songs, which in the composer's mind might have been simply a tune. Subodh does not easily forget any discussion on music. We discussed this long ago. Let us see what we make of it. Very true, SoY. It is amazing how we only talk about the singers and composers when it comes to music. For years, lyricists were not mentioned; once they were, we forgot the musicians who were the backbone of the melodies, the arrangers who gave body to the composer's ideas, and so on. Our legacy of music would have been so much the poorer if it weren't for these men (and a few women). Looking forward eagerly to the post that you and Subodh discussed. Beautifully written piece of article, dear Anu! I had never heard of Van Shipley. Sounds so Dutch! Just imagine, he contributes so much to the music of Hindi Film Music and hardly anybody has heard of him. Thanks for bringing him from the background to the fore. How interesting to know about him being the first electro-guitarist in India. I just didn't know that one could build one's own electric guitar, but that is I think, because I hardly anything about music. Thank you, Harvey. It's sweet of you to say so. This post was a labour of love, and it's nice to see it was appreciated. It is, isn't it? The whole of Barsaat centred around the violin music.